It’s no secret around here that I like to cook big when I can. A big pot of beans, a big pot of soup, a big pot of chili. Doubling a recipe saves time and isn’t much more work than making a single recipe. Usually when I double up, I’m feeding a crowd or making one meal for tonight’s dinner and another to freeze for another time. But then there are occasions when I make a huge pot of something and just eat it twice a day for a week. This soup is one of those somethings. It’s that good. You might think that March 2 is a little early to be declaring anything the “Best of 2012.” But I’m pretty sure. I’ve had a go-to red lentil soup recipe for years (it was The Best Red Lentil Soup of 2008 or thereabouts, and has held the title since). This soup has replaced it with a vengeance. The Best Red Lentil Soup of 2012: Bring 1 c. red lentils and 1 c. yellow split peas (both picked over and well-rinsed) to a boil in 7 c. water. Reduce heat to a simmer, add a chopped carrot and 2 tsp. finely minced ginger (I like to grate it with my Microplane), and simmer until split peas are entirely soft, 30-45 minutes. Meanwhile, heat a gob of coconut oil in a separate pan and saute a bunch of chopped green onions (reserve a handful for garnish) with 2 more Tbsp. minced ginger and 1/3 c. golden raisins. After two minutes, add 2 Tbsp. Indian curry powder and saute for another minute, stirring constantly, then add 1/3 c. tomato paste and stir for one minute more. When the lentils and peas are soft, add the tomato-spice mixture to the soup with a can of coconut milk and 2 tsp. salt. Simmer uncovered for a bit to blend the flavors and thicken the soup; you can adjust the consistency with more water or more cooking. Serve over cooked brown rice, garnished with those reserved chopped green onions, chopped cilantro, and a dollop of Greek yogurt. 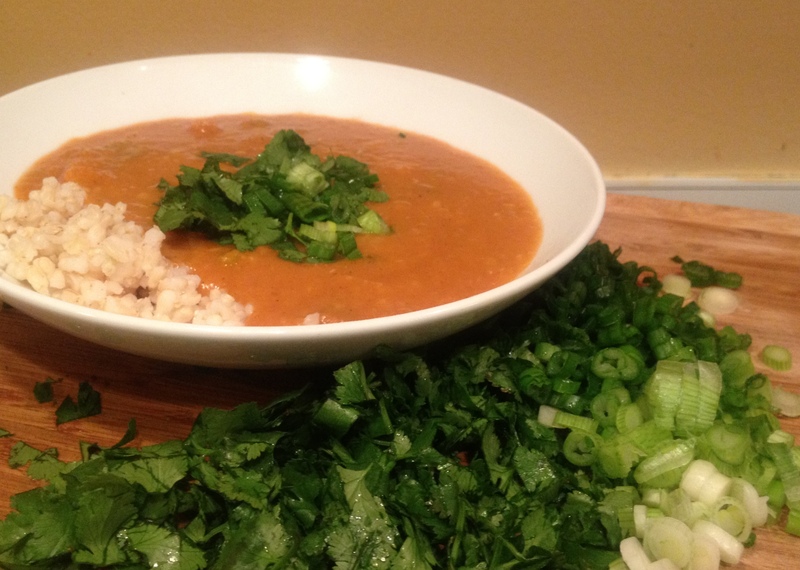 If you try this and know of a better red lentil soup recipe, please let me know in the comments. I never get tired of lentil soup. This entry was posted in Beans and Other Legumes, My Favorite Recipes, Soups, Vegan or Would-Be-Just-As-Good-Vegan and tagged cooking, family, food, homemade, lifestyle, recipes, soup, vegan, vegetarian on March 2, 2012 by emmycooks. I like cooking big too :D. This sounds delicious! I have red lentils in the pantry and on your wonderful recommendation I know what to make soon. Nice! I always like being inspired to cook up ingredients that I already have on hand. :) Enjoy! This sounds really good and looks hearty. I’ve never used coconut oil or put raisins in a soup before, so I think it’s time to try something new! Look wonderful! 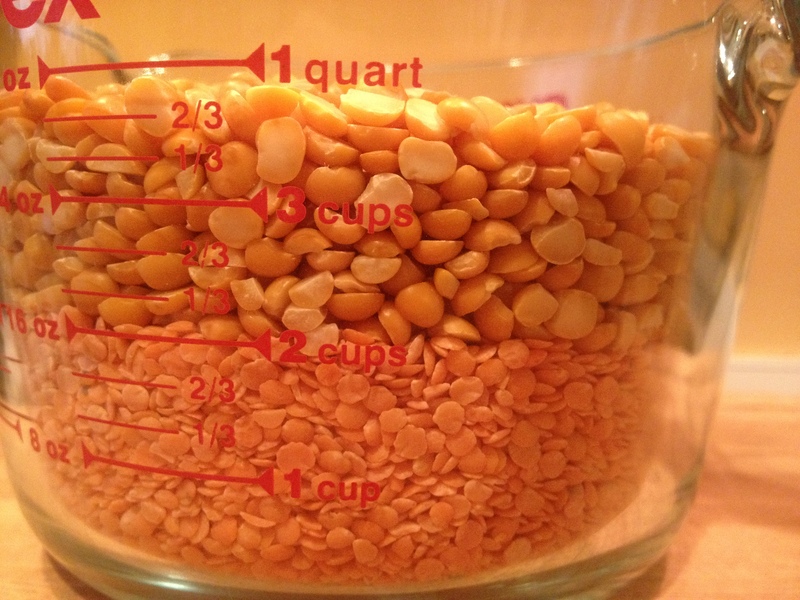 I am a huge fan of red lentils but the rest of my family is not….so..as much as I too love to cook big, I have been forced to cook only what I will eat! Still worth it though and red lentils are cheap, delicious, and always look wonderful!